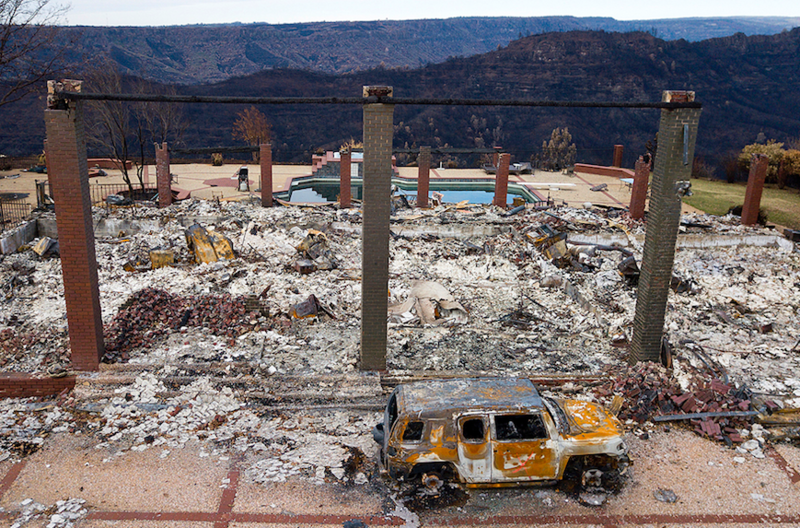 Paradise, Calif. on Dec. 8 after the Camp Fire. FEMA building five “group housing sites” in Oroville, Orland, Gridley and Chico. Planned site in Chico upped from a proposed 48 units to 82. The first few FEMA trailers, officially ‘Manufactured Housing Units” have arrived at the Rosewood site in Oroville. Proposed move-in dates of mid-April seem likely to be pushed back. Problems more severe Paradise Irrigation District’s delivery system than the systems owned by Del Oro Water Company. PID says repairs could take two to three years. PID intends to work methodically, starting from the highest elevations and working downhill. Responsibility of utility ends at water meter. Unclear what help, if any, property owners might receive to repair or replace service lines between meters and homes. Suspended due to rain, but likely to start again Monday. 80 parcels have been cleaned and cleared. 200,000 tons of debris removed. Deadlines extended---Both the free government debris removal program and the alternative debris removal programs have been extended to April 15th. Environmental Health at 202 Mira Loma Drive in Oroville.